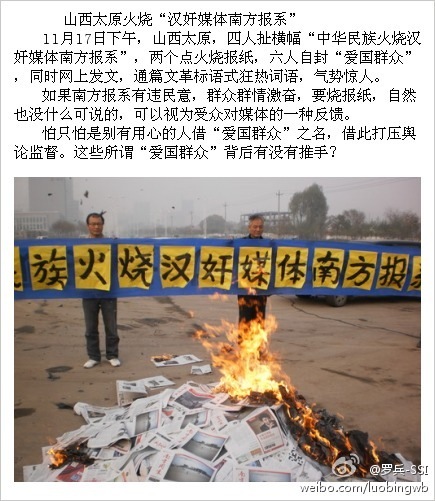 Is investigative journalism a crime against the Chinese people? Is free speech a Western Conspiracy? The nationalists in China seem to think so. 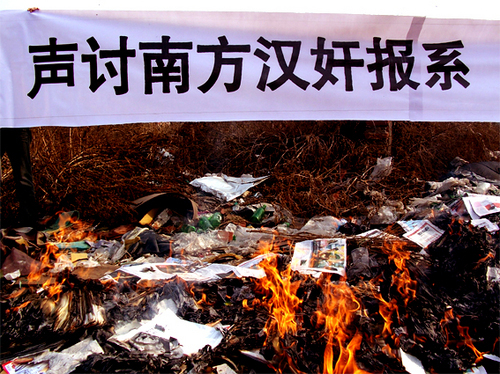 On Oct. 18, a group of men in Hebei Province performed a public ceremony in the name of patriotism, in which they burned newspapers and magazines of the Southern Media Group (Nanfang, 南方传媒), which is known for its investigative journalism and social criticism. This group of men accused the Southern Media of attacking the Chinese leaders, promoting the so-called universal values, acting as agents of American imperialism, undermining social stability with rumors and slander, and pushing China towards re-colonization. This group organized the ceremony via web forums such as “The Land of Wuyou” and “Qianggu Forum”. The logic of these men is not surprising to me at all. It is consistent with the way of thinking among nationalists in China that I have observed through my online and offline conversation with grass-root nationalists during the course of my dissertation research. The Southern Media has been one of the few voices in China that dare to expose corruption and social injustice, question many of the government’s policies, and pay attention to the disenfranchised communities in the past 20 years. But what offended the nationalists is that the Southern Media makes the Chinese society look bad in comparison to other countries. It didn’t matter whether the Southern Media’s stories are true or whether their criticism is constructive, the nationalists interpret any mentioning of China’s weakness as a threat to the image of a supreme Chinese people central to their belief system. The Southern Media’s advocation for more accountability of the powerful was interpreted as a promotion of Western ideologies. As I pointed out before, the nationalists position themselves against whatever considered Western, so for them, values like democracy or human rights are just components of imperialist conspiracies that aim to shape China in the image of the West. No wonder they called the Southern Media “traitors of Han who are selling China to the West”. Previous post Shanghai Government to Sponsor Hacking Spaces?